I love Souls games, but until recently, I hadn’t played much of the first Dark Souls. That’s changed with Dark Souls: Remastered, and it’s been a fascinating experience. I played a few hours of Demon’s Souls in 2009 after seeing a bunch of smart people raving about it online, but couldn’t get my head around it. It seemed too janky, too awkward, and too difficult. When Dark Souls came out in 2011, I was still intimidated by these kinds of games, and didn’t even try it. I had just started writing for Kotaku, and remember my then-colleague Michael McWhertor chiding the rest of the staff for giving our Game of the Year award to Skyrim instead of Dark Souls all while wondering if, based on his review of the game and the fact that so few of us had played it, he maybe had a point. By the time Dark Souls 2 hit in 2014, I was ready to give another Souls game a shot. I played a significant amount of that game, maybe 10 or so hours. It was enough to defeat The Pursuer (easily the toughest Souls boss I’d ever defeated), unlock a bunch of areas, and get my head around the combat. I remember being bummed out by how many people disliked the game and feeling like I’d missed the boat on this series. I eventually lost interest and stopped playing. Even just looking at a screenshot of Bloodborne makes me want to go play it all the way through again. In 2015, Bloodborne changed everything for me. This was it: the FromSoftware game I’d been waiting for. I devoured it, and still think of it regularly. It remains one of my favorite video games. I wrote a ton about it for Kotaku, and even wrote our mega-tips-post for the game. I was a convert. After Bloodborne, I attempted to go back and play the original Dark Souls, but it was never quite the right time. It was so much slower than Bloodborne, and so much more complicated. My longest attempt got me past the Taurus Demon and then I kind of lost interest. Part of the problem was that I had modded the PC version to get it running at 60fps but there were enough lingering bugs (for example, I couldn’t quit the game normally without getting stuck at a black screen) that I never quite felt like diving in. Dark Souls 3 came out just a year after Bloodborne, and once again I was fully sucked in. I sank a good 80 hours into that game, even as I saw the complaints that the series still hadn’t quite recaptured the first game’s glory. I played some of the DLC as well, though I didn’t finish everything. I obsessively played Team Ninja’s Nioh when it came out in 2017. Ugh, that game is so good. While not a FromSoftware game, it was yet another Souls-ish game that I allowed to utterly consume me. It’s 2018, and Dark Souls Remastered is out. Turns out this is what I was waiting for—a largely unaltered version of Dark Souls redone for modern systems, with a bunch of new players on the servers. Okay so I’m using a spear, whatever, shut up, it’s only until I find a katana. The experience of really buckling down and playing Dark Souls after sinking so many hours into its sequels and successors is, I would imagine, a little like going back to the first Captain America and Thor movies after first watching Avengers: Infinity War. Narratively, I’m seeing characters at the beginning that I’ve already met at the middle and the end. I’ve run into recurring characters like Solare of Astora and the jolly Onion Knight, Siegmeyer of Catarina, for the first time, despite the fact that I already know them from the sequels and years of memes. I’m also learning firsthand about the various mechanical refinements and changes From has made over the years, not all of which have necessarily improved the series’ formula. Dark Souls’ intricate level design is easily its most striking aspect, at least for someone accustomed to the less tightly-wound regions of Bloodborne and Dark Souls 3. Dark Souls’ kingdom of Lordran is dense and actually pretty small, a collection of stacked regions built like an intricate Lego construction. Now that I’ve played more of the game, the illustration is even cooler. Equally significant is the lack of a fast-travel option, mostly because of how it impacts the level design. I knew that Dark Souls 2’s addition of fast-travel had been controversial—really a reversion to a norm established in Demon’s Souls, which also had fast-travel—though it took seeing Dark Souls in action to understand why. Both Bloodborne and Dark Souls 3 allowed you to fast-travel from save points, which as I played those games struck me as a pleasant convenience. But playing Dark Souls underlines just how fundamentally a lack of fast-travel can change one of these games. After making my way through the Undead Burg, defeating the Taurus Demon and surviving a dash across the Wyvern-guarded bridge, I found myself safe by a bonfire in the Undead Parish. (I did not discover the kick-down ladder back to the Undead Burg until much later. What can I say, it’s easy to miss.) I made my way past a big armored boar, fought a bunch of smaller undead dudes, did some dying, and finally started to feel like I was getting a handle on the new area. But I was also feeling unmoored in a way that I’ve never quite felt in a Souls game, because there was no easy way for me to get back to where I’d started. In Bloodborne as in Dark Souls 2 and 3, it’s a cinch to return to your home base at any point to rest, recharge, and upgrade your gear. This was also true in Demon’s Souls, meaning the feature’s removal in Dark Souls was an experiment that was never repeated. Dark Souls’ Firelink Shrine feels like a similar safe zone to those other games, but there’s no way to quickly teleport there. That had a noticeable effect on my mindset during that first excursion into the Undead Parish. The farther I got, the more I felt like I was out on my own. I crept through the cathedral at the top of the Parish and found what looked like an elevator built into the confessional. What followed was something I’ve never quite experienced in a Souls game. I climbed on the elevator, unsure where it would take me. Down I plunged, until I saw a familiar aqua green hue through the window. Could it be… it was! I had just unlocked a shortcut all the way back down to Firelink Shrine. I had been expecting that kind of thing from this game, but it was an eye-opening experience just the same. So this is how this game works, I thought. Without fast-travel, every point in Lordran must be connected to every other point by a series of shortcuts. In order to quickly get around, I’ll have to mentally chart the entire game, with no shortcuts or fast-travel options to break things up. Bloodborne pulls a similar trick with a massive ladder up from the depths of the Forbidden Woods connecting back to the starting area of Central Yharnam. But that shortcut felt substantially different because of Bloodborne’s fast-travel. I could have warped to Central Yharnam any time I pleased, thanks to Bloodborne’s workshop hub and lantern warping. It was neat to see how the woods connected to the city, but it was an academic sort of neatness, not a functional one. I understand how Bloodborne’s structure benefits from a more diffuse arrangement of levels—some of the regions are set amid dreamscapes and on alternate planes of reality, after all. But Dark Souls’ approach makes for a more extreme distillation of the thing I love most about these games—mastering levels by exploring every nook and cranny. I can already understand why people lamented the re-addition of fast-travel in later games. In her review of the remastered edition, my Dark Souls-expert colleague Heather Alexandra mentions that the game loses track of its puzzle-box exploration at the extreme ends of Lordran, which makes me a little skeptical that I’ll actually finish the game. I’m psyched to at least reach those far ends, though. Navigation is the most immediately noticeable difference between Dark Souls and its successors, but I’ve noticed plenty of other changes, as well. There’s the overall slowness compared with later games, with roll-dodges enabled only along a four-way axis instead of the eight-way diagonal-axes of later games. Enemies are slower too, and less aggressive than I’ve gotten used to in Bloodborne or even Dark Souls 3. There’s the fact that backstabbing is notoriously easier in Dark Souls, which I’ve been happy to exploit by hugging and circling low-level enemies when we fight. There’s the overall graphical simplicity compared with later games, which makes areas easier to “read” at a glance, if occasionally a little drab. There’s also the fact that this game already has years’ worth of accumulated knowledge built up around it. That made it easy to watch guides leading to the best starting weapons and armor, an indulgence I aborted when I realized how quickly it was undermining the process of joyful discovery that makes me love these games. I did a well-known suicide run into the Valley of the Drakes to grab the Dragon Shield and Astora’s Straight Sword, and immediately regretted it. Better to discover things on my own. If and when Sony releases a remastered Demon’s Souls for PS4, I imagine I’ll have a similarly eye-opening experience diving into that. Heck, the same would probably go for a return to From’s much older King’s Field games, though I gather those don’t hold up nearly as well. It’s common to only get into a video game series on its second or third iteration. The developers working on a franchise have many years to work out kinks and refine their approach, to the point that sometimes, the early games just don’t hold up. I’m happy to say that Dark Souls holds up, and helps me better appreciate the subsequent Souls games I’ve already played and mastered. 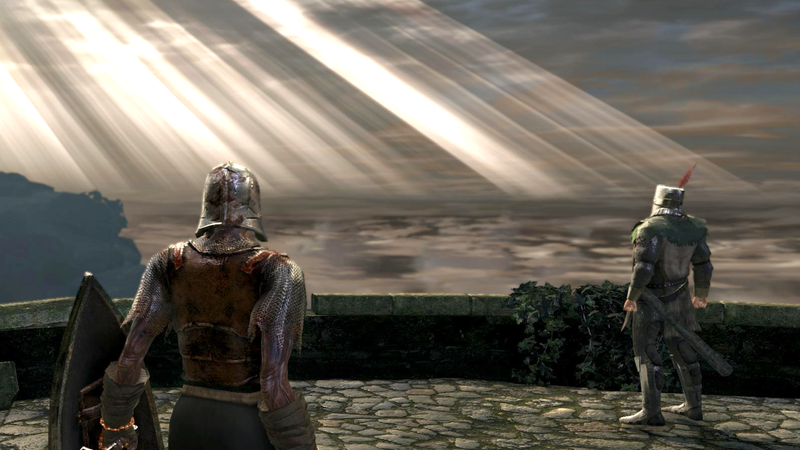 After spending years falling in love with what this series has become, my return to Dark Souls has helped me better appreciate where so much of it began. It’s been an unusual sort of homecoming, but a welcome one.